Not to be confused with Body water. A body of water or waterbody (often spelled water body) is any significant accumulation of water, generally on a planet's surface. The term most often refers to oceans, seas, and lakes, but it includes smaller pools of water such as ponds, wetlands, or more rarely, puddles. A body of water does not have to be still or contained; rivers, streams, canals, and other geographical features where water moves from one place to another are also considered bodies of water. Most are naturally occurring geographical features, but some are artificial. There are types that can be either. For example, most reservoirs are created by engineering dams, but some natural lakes are used as reservoirs. Similarly, most harbors are naturally occurring bays, but some harbors have been created through construction. Bodies of water that are navigable are known as waterways. Some bodies of water collect and move water, such as rivers and streams, and others primarily hold water, such as lakes and oceans. The term body of water can also refer to a reservoir of water held by a plant, technically known as a phytotelma. Bodies of water are affected by gravity which is what creates the tidal effects on Earth. A weir in Toledo, Spain. Weirs are frequently used to change the height of a riverlevel, prevent floddings, and measure water discharge. Note that there are some geographical features involving water that are not bodies of water, for example waterfalls, geysers and rapids. Arm of the sea – also sea arm, used to describe a sea loch. Arroyo – a usually dry creek bed or gulch that temporarily fills with water after a heavy rain, or seasonally. See also wadi. Artificial lake or artificial pond – see Reservoir (impoundment). Barachois – a lagoon separated from the ocean by a sand bar. Bay – an area of water bordered by land on three sides, similar to, but smaller than a gulf. Bayou – a slow-moving stream or a marshy lake. Beck – a small stream. Bight – a large and often only slightly receding bay, or a bend in any geographical feature. Billabong – an oxbow lake in Australia; a pond or still body of water created when a river changes course and some water becomes trapped. Brook – a small stream. Burn – a small stream. Canal – an artificial waterway, usually connected to (and sometimes connecting) existing lakes, rivers, or oceans. Channel – the physical confine of a river, slough or ocean strait consisting of a bed and banks. See also stream bed and strait. Cove – a coastal landform. Earth scientists generally use the term to describe a circular or round inlet with a narrow entrance, though colloquially the term is sometimes used to describe any sheltered bay. Creek – a small stream. Creek (tidal) – an inlet of the sea, narrower than a cove. Delta – the location where a river flows into an ocean, sea, estuary, lake, or reservoir. Distributary or distributary channel – a stream that branches off and flows away from a main stream channel. Drainage basin – a region of land where water from rain or snowmelt drains downhill into another body of water, such as a river, lake, or reservoir. Draw – a usually dry creek bed or gulch that temporarily fills with water after a heavy rain, or seasonally. See also wadi. Firth – a regional term of Scotland used to denote various coastal waters, such as large sea bays, estuaries, inlets, and straits. 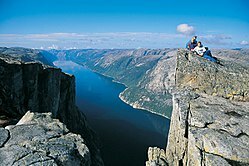 Fjord (fiord) – a narrow inlet of the sea between cliffs or steep slopes. Glacier – a large collection of ice or a frozen river that moves slowly down a mountain. Gulf – a part of a lake or ocean that extends so that it is surrounded by land on three sides, similar to, but larger than a bay. Headland – an area of water bordered by land on three sides. Harbor – an artificial or naturally occurring body of water where ships are stored or may shelter from the ocean's weather and currents. Impoundment – an artificially-created body of water, by damming a source. Often used for flood control, as a drinking water supply (reservoir), recreation, ornamentation (artificial pond), or other purpose or combination of purposes. Note that the process of creating an "impoundment" of water is itself called "impoundment." Inlet – a body of water, usually seawater, which has characteristics of one or more of the following: bay, cove, estuary, firth, fjord, geo, sea loch, or sound. Kettle (or kettle lake) – a shallow, sediment-filled body of water formed by retreating glaciers or draining floodwaters. Kill – used in areas of Dutch influence in New York, New Jersey and other areas of the former New Netherland colony of Dutch America to describe a strait, river, or arm of the sea. Lagoon – a body of comparatively shallow salt or brackish water separated from the deeper sea by a shallow or exposed sandbank, coral reef, or similar feature. Lake – a body of water, usually freshwater, of relatively large size contained on a body of land. Loch – a body of water such as a lake, sea inlet, firth, fjord, estuary or bay. Mangrove swamp – Saline coastal habitat of mangrove trees and shrubs. Marsh – a wetland featuring grasses, rushes, reeds, typhas, sedges, and other herbaceous plants (possibly with low-growing woody plants) in a context of shallow water. See also Salt marsh. Mere – a lake or body of water that is broad in relation to its depth. Moat – a deep, broad trench, either dry or filled with water, surrounding and protecting a structure, installation, or town. Ocean – a major body of salty water that, in totality, covers about 71% of the Earth's surface. Oxbow lake – a U-shaped lake formed when a wide meander from the mainstem of a river is cut off to create a lake. Phytotelma – a small, discrete body of water held by some plants. Pool – various small bodies of water such as a swimming pool, reflecting pool, pond, or puddle. Pond – a body of water smaller than a lake, especially those of artificial origin. Puddle – a small accumulation of water on a surface, usually the ground. Rill – a shallow channel of running water. These can be either natural or man-made. River – a natural waterway usually formed by water derived from either precipitation or glacial meltwater, and flows from higher ground to lower ground. Roadstead – a place outside a harbor where a ship can lie at anchor; it is an enclosed area with an opening to the sea, narrower than a bay or gulf (often called a "roads"). Run – a small stream or part thereof, especially a smoothly flowing part of a stream. Salt marsh – a type of marsh that is a transitional zone between land and an area, such as a slough, bay, or estuary, with salty or brackish water. Sea – a large expanse of saline water connected with an ocean, or a large, usually saline, lake that lacks a natural outlet such as the Caspian Sea and the Dead Sea. In common usage, often synonymous with ocean. Sea loch – a sea inlet loch. Sea lough – a fjord, estuary, bay or sea inlet. Seep – a body of water formed by a spring. Slough – several different meanings related to wetland or aquatic features. Source – the original point from which the river or stream flows. A river's source is sometimes a spring. Sound – a large sea or ocean inlet larger than a bay, deeper than a bight, wider than a fjord, or it may identify a narrow sea or ocean channel between two bodies of land. Strait – a narrow channel of water that connects two larger bodies of water, and thus lies between two land masses. Stream – a body of water with a detectable current, confined within a bed and banks. Subglacial lake – a lake that is permanently covered by ice and whose water remains liquid by the pressure of the ice sheet and geothermal heating. They often occur under glaciers or ice caps. Lake Vostok in Antarctica is an example. Swamp – a wetland that features permanent inundation of large areas of land by shallow bodies of water, generally with a substantial number of hummocks, or dry-land protrusions. Tarn – a mountain lake or pool formed in a cirque excavated by a glacier. 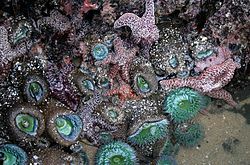 Tide pool – a rocky pool adjacent to an ocean and filled with seawater. Tributary or affluent – a stream or river that flows into a main stem (or parent) river or a lake. Vernal pool – a shallow, natural depression in level ground, with no permanent above-ground outlet, that holds water seasonally. Wadi – a usually dry creek bed or gulch that temporarily fills with water after a heavy rain, or seasonally. See also Arroyo (creek). Wash – a usually dry creek bed or gulch that temporarily fills with water after a heavy rain, or seasonally. See also wadi. Wetland – an environment "at the interface between truly terrestrial ecosystems and truly aquatic systems making them different from each yet highly dependent on both". ^ Langbein, W.B. ; Iseri, Kathleen T. (1995). "Hydrologic Definitions: Stream". Manual of Hydrology: Part 1. General Surface-Water Techniques (Water Supply Paper 1541-A). Reston, VA: USGS. .
^ "What causes high tide and low tide? Why are there two tides each day?". HowStuffWorks. 2009-05-21. Retrieved 2017-12-10. ^ "Definition of FJORD". www.merriam-webster.com. Retrieved 2017-06-15. 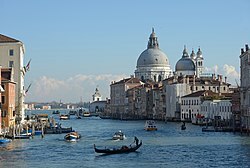 Wikimedia Commons has media related to Bodies of water.